You’ve installed the Facebook Pixel with Civil Pixels and want to get the most out of it. We can do that with retargeting! Retargeting or remarketing is an advertising technique where we show your ads to customers that performed a certain action on your site. For example, we can show a specific ad to Facebook users who added an item to their cart but did not checkout. Or show ads for pants to customers who searched for pants on your store. We do this by making Facebook audiences and picking them when creating ads. The Facebook Pixel from Civil Pixels is installed. Not sure how? Here’s the installation guide. Once you’ve collected some data, you can make some audiences to target for your next ad. Head over to Facebook’s Audiences. 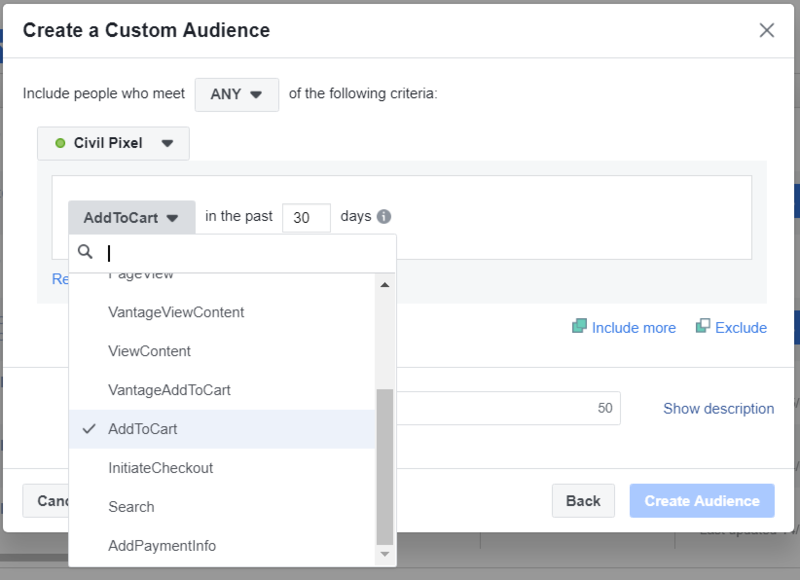 Select the Create Audience dropdown and click on Custom Audience. A popup will appear with lots of options. We want Website Traffic – select it to move on. You’re now on the custom audience creation screen! Select the pixel you used when setting up Civil Pixels. Then click the dropdown shown below. Select the event you want to create an audience from. Enter how far in the past you’d like to gather your audience from. Click on the Url dropdown to select the event parameter you’d like to target by. Not sure what each parameter is? We made a complete Facebook event guide. You can add as many criteria as you like, just click Include More. Once you’re done, give your audience a name and click Create Audience. Your audience is now created. When you’re creating ads, you can now select this audience to target. If you’re not sure what you can target based on, check out our guide on what events Civil Pixels implements for you.